What type of router is needed? What type of broadband router do I need on a Pivit internet access service? Pivit’s internet access service does not require a broadband router but a router is recommended. 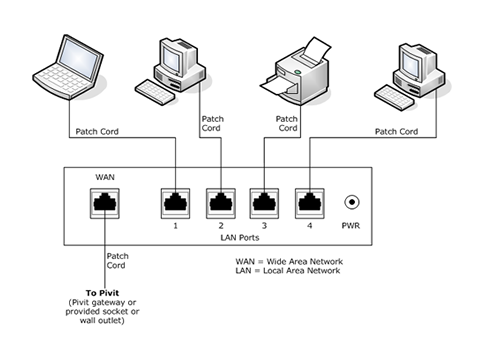 A broadband router enables multiple PC’s to share a single Internet connection by creating a home local area network (LAN). Routers can also provide some basic security to the home LAN. A broadband router usually has a single WAN or Internet port and 1 or more LAN ports. Please see the illustration below. Any broadband router should work, however ADSL modem routers are not suitable. The following list is indicative only of routers that Pivit customers have successfully connected to the Pivit network. The above list is not intended to be exhaustive, merely an indication. Need help setting up your router? Call the router manufacturer or contact a support company like IT Hotline. About your Pivit Internet connection. Pivit Internet handoff is a RJ45 Ethernet network connection. The Internet connection type is dynamic DHCP. (An IP address is automatically provided to the customer router by Pivit’s network). (Please note that DHCP leases are only issued every 15 minutes. This means that if you unplug the device (router) that is connected directly to Pivit, and then plug in a different device (another router or a PC maybe), it will take 15 minutes for a new session to be established. Please click on the manufacturer of your router below for assistance in setting up your broadband router. For information about choosing a router that will operate on the Pivit network please see ‘What Type of router is needed? Why is there a time delay if I disconnect my broadband router or PC and connect a different device? Pivit’s architecture is much simpler than other systems deployed (like DSL). For instance a broadband router is not required to connect to the Pivit service, likewise complex authentication systems using PPPoE are not utilised. Pivit’s systems provide an IP address to a single device (PC, router, server) in a customer’s premises by using the DHCP protocol. The DHCP lease time provided by the Pivit network is a minimum of 15 minutes and a maximum of 30 minutes. Can I use a wireless router or access point on a Pivit internet access service? YES, although Pivit does not support wireless routers or access points. Be sure to use the security settings on your router. How can I protect my wireless network? There are some simple methods to protect your local wireless network from hackers. I can’t browse the Internet or receive email, what do I do now? Try to browse the Internet again. Do I need a phone line for Internet access? Pivit’s services do not use last generation copper technology or phone wiring to deliver Internet access services. Our fibre-optic based services enable high speed services without the need for a phone line. Of course, if you’d like a phone, that’s no problem. Our next generation network enables many phone lines at each premises. How can I work out my internet data usage? The following table provides data usage estimates. It can be used to gain a better understanding of how much data you may be using which may assist you in deciding which plan is best suited for you. Please note that your actual usage may may be different to the usage described below as it will depend on the device used, the technology used and other factors. Information provided is an estimate only. Logon on to the Pivit Account Management System for up to date usage. A quick note about Torrent and file sharing applications. These applications can consume a huge amount of your monthly data transfer allocation, not only because of the downloads, but also because the files downloaded usually become shared by your computer to the ‘rest of the world’. Comparing Pivit’s internet access service with other providers? Pivit’s services are fully symmetrical services. That is, you can upload as fast as you can download data. This is perfect for sending pictures to friends, uploading a movie to YouTube or just for sending emails. Compare this with other providers who only offer uploads at about 10% of the speed of downloads. What are Pivit’s email settings? IMAP is not supported. SSL is not supported. Outbound (SMTP) authentication is not required. Can I use another outbound mail server? Due to the proliferation of spam, Pivit only allows outbound mail / SMTP (port 25) via Pivit’s mail servers for residential account customers. All other outbound mail servers are blocked. Can I use another outbound email server? Spam is the common term for electronic ‘junk mail’ – unwanted messages sent to a person’s email account or mobile phone. The content of spam messages varies. Some messages promote products or services, while others attempt to trick users into providing bank account or credit card details. Many spam messages contain offensive or fraudulent material, and some spread computer viruses. Spam now makes up the majority of email traffic. Billions of unwanted spam messages clog up the internet, disrupt email delivery, reduce productivity and irritate users. Can I Access My Email When Travelling? Pivit Webmail is a great way to access email when not at home. You can access Webmail via any browser anywhere in the world. If you are travelling with your laptop you can also download (POP) your email to it via any network connection anywhere in the world. However, Pivit like most ISPs only allow outbound email via their own email server when connected to their network. So it is likely that you will need to change your outbound email server to the one specified by the ISP you are connecting through. Click here or type http://webmail.pivit.net.au into your web browser. The same username and password that you use with your email client (like MS Outlook/Express) should be used here. Your PC, type of service, the web site your using and even your own Wi-Fi router. The performance of web sites and other servers (like mail and gaming servers) that you connect to. The above factors are the key ‘bottlenecks’ to Internet performance. Pivit (or any other ISP) is unable to guarantee Internet access speeds for these reasons. A good test of performance is to go to Pivit’s speedtest webpage. Please do this speedtest just before you contact Pivit’s support team. Can I change my broadband Plan? Absolutely, we understand that customer’s needs change from time to time. For a full list of our new plan options please click here. Changing to a higher plan. Customers can change during the current month to a higher plan at anytime by clicking here and selecting ‘I have a current Pivit account and would like to change plans‘. The current month invoice will be at the new higher rate. Customers must remain on the higher plan for a minimum of two calendar months (the current month plus one more month). Changing to a lower plan. Customers can change to a lower plan by clicking here and selecting ‘I have a current Pivit account and would like to change plans‘. Changing to the lower plan will take effect from the beginning of the next month and will incur an administration fee of $30.00 per change. What is Pivit’s Fair Use Policy? The use of Pivit’s internet access service is subject to Pivit’s Fair Use Policy. This policy does not set a fixed maximum limit on the amount of data a customer is allowed to download or upload, but it does allow Pivit to act if an individual customer consistently downloads or uploads significantly more than the average Pivit customer or if uploads exceed downloads by more than four times. At the sole discretion of Pivit, should a customer’s use of the Pivit internet access service fall outside Pivit’s Fair Use Policy, Pivit reserves the right to restrict or suspend the Internet service to that customer. This fair use policy should be read in conjunction with Pivit Terms and Conditions. Pivit values all customer feedback and aims to provide customers with the best possible service. While we aim to provide you with a great service we know that you may wish to express dissatisfaction with our service, procedures, staff or products. Pivit has a complaint policy to help ensure that we can resolve your complaint quickly, fairly, efficiently and courteously. During the process of your complaint, we will aim to provide a fair and reasonable outcome for all parties involved. Once accepted, we aim to resolve your complaint within 10 business days or less. Please click this link to visit our complaints page and follow the steps to escalate and raise your complaint. Your Pivit telephony service includes many advanced telephony features. All features other than voicemail are included in the monthly line rental charge. Download this Pivit Residential Telephone Advanced Features Guide make the most out of your Pivit telephone service. 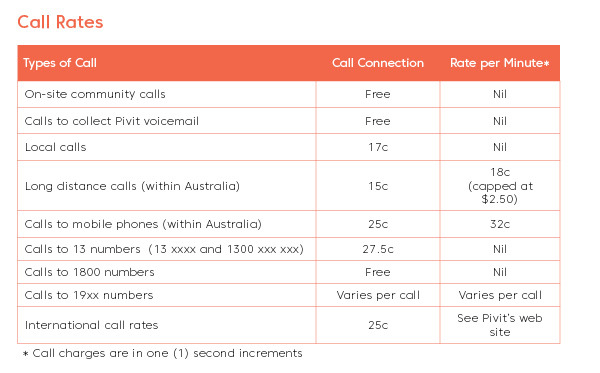 What are Pivit's call rates? What about the dial tone? Pivit’s dial tone is different to legacy telephone services. Pivit’s dial tone is a solid tone. Voicemail is available for a small monthly charge. Please see the Residential Pricing and Service information Guide for pricing. Please complete a service activation pack to establish the service. See the services menu above. Can I receive digital TV? YES – Digital TV using a digital set top box or a TV with an integrated digital tuner can be used on Pivit’s Fi-TV™ network. Both standard definition (SD) and High Definition (HD) tuners are supported. Can I get pay or subscription TV? YES – Pivit’s Fi-TV™ video and television services enable the use of Pay or Subscription TV from Foxtel and Austar (where appropriate). Please contact the Subscription TV provider in your area to subscribe. These Pay or Subscription TV services are provided directly by the service provider. How do I optimise TV reception? Pivit’s Fi-TV™ video and television services are delivered by fibre optic cable to your premises. To receive all channels and to optimise TV reception please do a an ‘auto-tune’ on your TV. How do I appoint an authorised representative for my account? An Authorised Representative (also known as a Third party Authority) is a person appointed by the Account Holder to act on their behalf. If you are the Account Holder you may appoint a person to act on your behalf as your Authorised Representative for your Pivit service. What does it mean to have an Authorised Representative on my Pivit Account? Nominating a person as an Authorised Representative or Third Party Authority (TPA) means you authorise them to inquire about, accept and create charges on your account, as well as providing them with access to your personal information. What can an Authorised Representative do? How can I add an Authorised Representative to my account? How do I appoint an advocate for my account? What is the Pivit financial hardship policy? 1.1. You may be experiencing Financial Hardship when you are unable to meet the financial obligations of your agreement with Pivit for reasonable causes over a limited or long period of time. 2.1. If you are a residential customer or a small business customer and are experiencing financial hardship, this policy may apply to you. 2.2. We will assess your claim for eligibility and will consider your individual circumstances as part of the assessment. 2.3. If you are simply experiencing temporary payment difficulty, this policy would not apply to you. Please call us on 1300 66 33 20 to discuss your situation. 3.2. We will assess your claim, discuss your payment and service options with you and aim to reach a reasonable outcome. Possible solutions may be to apply credit limits, service restrictions or payment plans to assist you in looking after your related charges. 3.3. In addition to contacting us, we urge you to engage the assistance of a financial counsellor. We are aware that there are sometimes waiting lists to see financial counsellors so in the interim you may be asked for documents to substantiate your claim. 4.1. We may ask you to submit evidence to us to support your claim. 4.2. We will take into account your circumstance and financial position to reach a financial arrangement that is suitable to both you and us. 4.3. Payment arrangements will be made with the view to cover any future use and reduce your debt. 4.4. We may suggest that some or all of your services be restricted to prevent you falling further in debt whilst the arrangement is in place. We will attempt to contact you if this action becomes necessary and has not been discussed with you. Pivit reserves the right to change this Financial Hardship Policy at any time and notify you by posting an updated version of the Policy on our website. The amended Policy will apply between us whether or not we have given you specific notice of any change. We encourage you to review this Policy periodically because it may change from time to time. 4.5. We will send you written confirmation of the agreed arrangement only if you request us to do so. 4.6. We will attempt to contact you both by telephone and letter should the arrangement not be kept by you; prior to us taking further credit management action. 4.7. If you require us to review your arrangement due to a change in your circumstance we will do so. 4.8. Whilst your payment arrangement remains in place we will not report your debt to a Credit Reporting Agency. make the agreed payments on the agreed dates. contact us within 48 hours of an agreed payment date if you are unable to keep your commitment. contact us to advise us if your circumstance has changed favourably or unfavourably during the term of the arrangement. act promptly and honestly at all times throughout the course of this arrangement. 6.1. In the event the arrangement is not adhered to and we have not been contacted by you, we will take reasonable steps to contact you or your authorised representative before taking further action. 6.2. The arrangement will be considered terminated after this time and full credit management action will resume. 6.3. In the event that you choose to cancel your account with us, the arrangement will no longer be valid and normal credit management action will apply. 6.4. Failure to make the agreed payments on a regular basis may result in termination of the arrangement. Evidence that you have engaged a financial counsellor or evidence of a pending appointment to see a financial counsellor. Medical certificates from treating specialist or other medical professionals. How do I lodge a claim for financial hardship? HOW TO LODGE A FINANCIAL HARDSHIP CLAIM? We understand that at certain times life presents circumstances that may affect your ability to meet your financial obligations. If you are having difficulty paying your Pivit bill, we may be able to assist you through our Financial Hardship Policy. We will assess your claim, discuss your payment and service options with you and aim to reach a reasonable outcome. Possible solutions may be to apply credit limits, service restrictions or payment plans to assist you in looking after your related charges. For more information please see our financial hardship policy located on this FAQ’s page. If you are a Pivit residential customer or a small business customer and are experiencing financial hardship, you are eligible to lodge a claim. We will assess your claim for eligibility and will consider your circumstances as part of the assessment. If you are simply experiencing temporary payment difficulty, our Financial Hardship Policy will not apply to you. Please call us on 1300 66 33 20 to discuss your situation. If you would like to lodge a financial hardship claim, please contact us by calling our team on 1300 66 33 20 within business hours, Monday to Friday, 9am – 5pm. You can also email billing@pivit.com.au or via our ‘Contact Us’ page on our website. Please be advised with we may ask you to submit evidence to us to support your claim. For more information on this policy, please review our financial hardship policy located on this FAQ’s page. How can I login to Pivit's Account Management System? Pivit’s Account Management System provides a suite of features to help you manage your account. Our team is ready to support you with all your enquiries during this time and will be working with you to ensure maximum service and minimum disruption. What is Pivit's billing cycle? Pivit invoices internet access and telephony line rental monthly in advance on the 1st of the month. This invoice is payable on or before the 15th of the month. Excess data charges (if applicable) and call charges are invoiced in arrears on the next month’s invoice. What about my first Pivit invoice? How do I relocate my services? How do I relocate my existing Pivit services to new premises? If you’re moving premises within your estate, more than likely Pivit will be able to continue your services at the new premises. Please complete the Relocation of Services Form found on the customer downloads page, sign it and forward it back to Pivit. If you’re moving off the estate, Pivit most likely will be able to deliver services if your new premises has access to the NBN Network. If you need to disconnect your current services please complete online Disconnection Request form – click here. Please be aware that fees may apply and that 30 days notice is required for billing. How do I disconnect my services? Moving away? We’re sorry to lose you as a customer. If your new premises are connected to the NBN Network, we can relocate your services for you. “I have a current Pivit account and would like to disconnect“. You can update or change your credit card details to pay your account via the customer portal on our website. Please follow the steps below to update or change your credit card. 1. Log in to your account using the customer portal. Click here to take you to the customer portal. 2. Click on payments. Next click on payment methods. 3. Click on Create payment method. 4. Add your new credit card details into the credit card details section. Ensure you tick the default payment checkbox located below the payment type field if you wish to have the new credit card billed the next month and the following months. (Please note if you don’t check the default payment checkbox it will not update in your account and you may have to pay decline fees if your credit card is not valid). If you would like any assistance with changing your credit card details on your account you can also talk to one of our friendly Customer Support representatives when you call 1300 66 33 20.